This is the inaugural year of the National Agri-Marketing Association Collegiate Sales Competition. This competition seeks to advance the practice and professionalism of selling and the sales profession. NAMA is seeking sponsors for this upcoming competition. Sponsorship provides exciting opportunities for your team to be involved in the event, gain access to talented students and strengthen your company’s reputation as a leader in the industry. Contact us now to give your company the opportunity to see this year’s sales presentations at the 2019 Agri-Marketing Conference. Find the list of opportunities below and email Jenny Pickett for more information. Click here for a list of available sponsorships. Vinh Giang will take your career to new heights by showing you how to cultivate the right influences that make the difference between success and mediocrity. With humor, heart & showmanship, he demonstrates the power of perspective and how people are fooled by illusions. 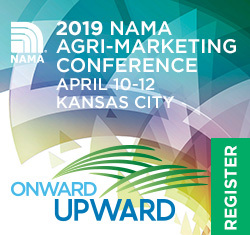 Join NAMA and Vinh in Kansas City, April 10-12, at the 2019 Agri-Marketing Conference. Register now! Position your company at the top, get to know potential new hires and invest in the rising stars of agribusiness through the NAMA Foundation. Sponsor the new NAMA Sales Competition or key components of the Student activities and be recognized as a leader. Be a part of this select group committed to securing scholarship funds for students. Attend and sponsor this fun event to connect yourself to current and future movers and shakers. Donate auction items that will raise funds to support scholarships and student programs. Get extra exposure as a sponsor of the first annual NAMA Sales Competition! Sponsorship provides exciting opportunities for your team to be involved in the event, gain access to talented students and strengthen your company’s reputation as a leader in the industry. When your company provides the NAMA Foundation with tax-deductible support, you ensure a strong future for students, your company and the industry. We’re grateful for all your company does to make the work of NAMA and the NAMA Foundation possible. Together, we can create success for tomorrow’s ag professionals and our industry. Please join your colleagues in contributing to the NAMA Foundation. Please make sure we hear from your company soon so you can receive the maximum exposure possible as a sponsor. Start your 2019 Agri-Marketing Conference with MoKan NAMA’s Taste of KC Tour! Understanding our customers and consumers is essential in animal agriculture. In this session, Hannah Thompson-Weeman, Animal Agriculture Alliance, will share the results of several new research projects examining current and emerging issues in the agriculture industry and what they could mean to the future of animal agriculture. It’s important to better understand hot topics in animal agriculture so you can advise your clients on how to be successful in an ever-changing marketplace. Attendees will leave more informed about current issues in animal ag and will have access to the full research results of each project to examine more closely. You are invited to a joint cocktail reception hosted by NAMA, NAFB and AAEA at Commodity Classic in Orlando! Stop by after the trade show closes but before you head out to dinner! We encourage you to bring a prospective member or guest to the reception. No cost or registration necessary. Sponsorship help provided by BASF and the Florida and Rocky Mountain NAMA Chapters. Recruit someone you know to become a NAMA member and be entered into a drawing for a complimentary registration* to the 2019 Agri-Marketing Conference in April. The campaign will run from February 25 through March 20. The drawing will take place March 21. Join Badger NAMA for a tour, nosing, tasting and appetizers at the J. Henry & Sons farm where you’ll learn about the history and heritage of their bourbon, roots in agriculture, and marketing strategies which help them to deliver exceptional bourbon to the market. Join Midsouth NAMA at the Gin Show for this year’s Student NAMA Presentation review. The Mississippi State team will join the chapter and present their product idea for the 2019 NAMA Student Marketing Competition. Join Southeastern NAMA as they host the student marketing teams from Abraham Baldwin Agricultural College and University of Tennessee – Knoxville for a critique of their presentations for the student marketing competition at the 2019 Agri-Marketing Conference. Email Michele Egan to RSVP by March 8.